It’s nice to have a fitting themed outfit if you want to play something like a mage, slowly getting corrupted by the arcane powers, or simply a warlock (though no one really needs a reason for wanting to look good – Teribeth is neither of the two). But black is a highly overused stereotype for both the good and the bad guys, so why not go with some colour instead? Also the first one completely ready for transmogrification, since it’s covering all visible armor slots (besides the bracers – not really visible in this^^) and all are of at least green quality. Chillwind Tunic: Another item I got from a quest, this time in the Western Plaguelands. I loved it because of the unique look and the unusual colour combination, the gem in the middle reminded me of the Jeweled Onyx Panther, so I luckily decided to keep it as well. Shoulderwraps of the Enthralled: Surprise, another quest reward! Again from the Western Plaguelands, but this time it’s not as unique. I already had them and thought they fit very well with the overall look, especially with the cloak, but there are other, completely different shoulders that can replace these, like the Shadoweave Shoulders (my favourite alternative), Regal Mantle, Resplendent Epaulets or the Felcloth Shoulders. Dusk-Stained Cloak: This one is obtainable rather early in the Blackfathom deeps, but for characters who already did the quest and chose a different reward it’s impossible to obtain. 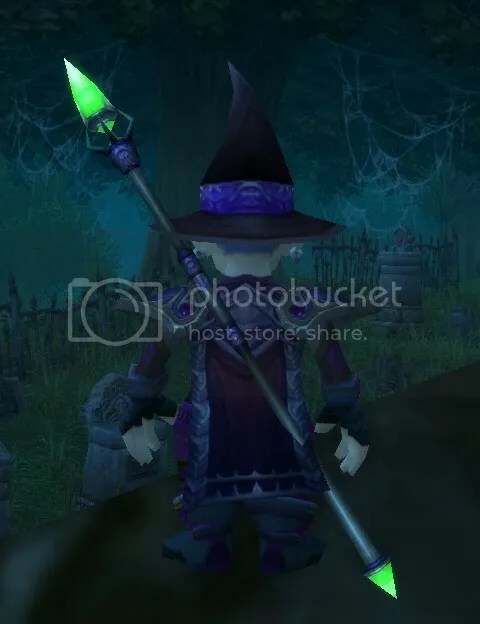 I guess the cloak can simply get left out or maybe replaced with another one that fits the outfit model and colour wise, but I’ll have to take a look into this first. Cilice of Suffering: The second quest reward from Terokkar Forest in this set, but the reason it fits so well is that it shares the same look with the Elder’s sash, and that works well with the gloves and boots obviously. Whelp Keepers Staff: This one goes perfectly with the chest armor because of the gem, so I picked it for the set after looking through many other options, it was simply the best looking in my eyes. It’s from yet another quest, this time in the Burning Steppes, but shares the same model with lots of other staves (there are many versions in green) and can be replaced easily. 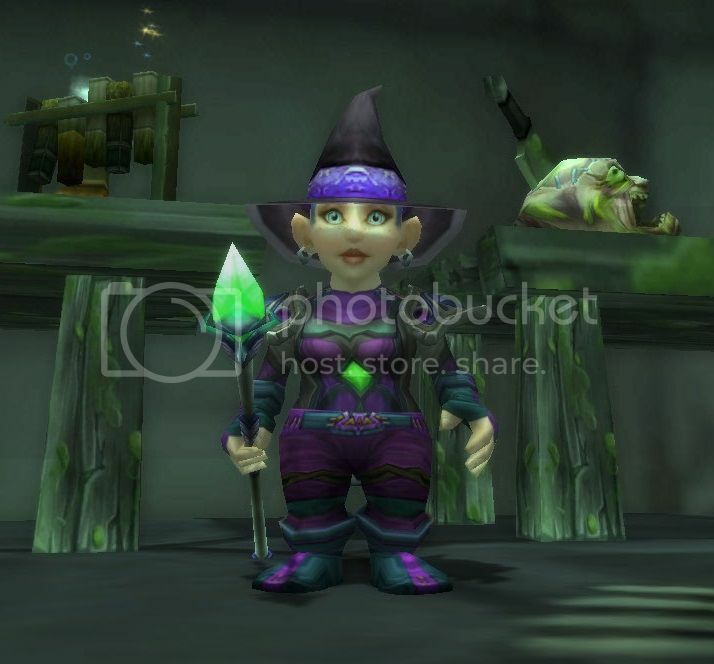 This entry was posted on Friday, August 2nd, 2013 at 00:06	and tagged with clothing, Quests, Roleplaying, Transmogrification, world of warcraft, WoW and posted in Armor Sets, World of Warcraft. You can follow any responses to this entry through the RSS 2.0 feed. My bank is full, my void storage is full…and yet, I’m not really much of a transmogger. The outfit I have on my main was one I got in MoP and liked. I am just a pack rat who cannot part with those items I longed for and raided weekly, hoping for that ONE drop.